An international team of researchers has published industrial blueprints for the construction of a large-scale ion-trapping quantum computing system. Quantum computing is a technology that gets people very excited, because it can solve problems far beyond the reach of traditional computers. Until now, most work on them has been done at a small scale in the laboratory. But now there's a construction plan for building a large-scale, modular quantum computer that would be able to tackle significant tasks. The architects of the plan say that it solves technical obstacles that had previously prevented a scale-up to a larger machine. There are several approaches towards building quantum computers, and the ion-trapping method that features in this plan is just one of them. 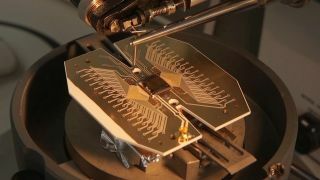 But it is one of the more promising, Jonas Helsen, a quantum computing researcher at Delft University of Technology who wasn't involved in the research, told TechRadar. "They figured out a solution to some major obstacles for scalability on this platform," he says. "They're aiming to kickstart Moore's law for quantum computing. It'll soon be possible to make thousands of these, which sets us on the path to millions and beyond." The team's next step is to build a prototype quantum computer based on this design at the University of Sussex, at a cost of about £1 to 2 million. A practical device for real-world applications would cost ten times more than that, at least. But those real world applications could include advanced encryption, simulating molecules for medical breakthroughs, new machine learning techniques for artificial intelligence and many more things that we haven't thought of yet. "Nobody was imagining the creation of Amazon.com when the first computers were being built in the 1950s," says Helsen. The full details of the system were published in the journal Science Advances.